Desalination is a separation process used to reduce the dissolved salt content of saline water to a usable level. In reverse osmosis water purification systems and all desalination processes involve three liquid streams: the saline feed water (brackish water or seawater), low-salinity product water, and very saline concentrate (brine or reject water). The saline feed water is drawn from open sea or underground beach well sources. It is separated by the desalination process into the two output streams: the low-salinity product water and very saline concentrate streams. The use of desalination overcomes the paradox faced by mankind, that of having access to a practically inexhaustible supply of saline water but having no way to use it. In the past, the difficulty and expense of removing various dissolved salts from water made saline waters an impractical source of potable water. However, starting in the 1950s, desalination began to appear to be economically practical for ordinary use, under certain circumstances. The product water of the desalination process is generally water with less than 500 mg/1 dissolved solids, which is suitable for most domestic, industrial, and agricultural uses. A by-product of desalination is brine. Brine is a concentrated salt solution (with more than 40,000 mg/1 dissolved solids) that must be disposed of, generally by discharge into deep saline aquifers or surface waters with a higher salt content. Brine can also be diluted with treated effluent and disposed of by spraying on golf courses and/or other open space areas. In the water reverse osmosis systems and reverse osmosis water purification systems process, water from a pressurized saline solution is separated from the dissolved salts by flowing through a water-permeable membrane. The permeate (the liquid flowing through the membrane) is encouraged to flow through the membrane by the pressure differential created between the pressurized feed water and the product water, which is at near-atmospheric pressure. The remaining feed water continues through the pressurized side of the reactor as brine. The major energy requirement is for the initial pressurization of the feed water. For brackish water desalination the operating pressures range from 250 to 400 psi, and for seawater desalination from 800 to 1000 PSI. 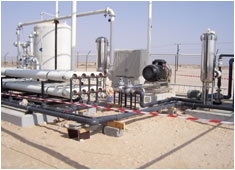 A Desalination R O System consists of four major components/processes: (1) Pretreatment, (2) Pressure Boosting, (3) Membrane separation, and (4) Post-treatment stabilization. Pre-treatment : The incoming feed water is pretreated to be compatible with the membranes by removing suspended solids, adjusting the pH, and adding a threshold inhibitor to control scaling caused by constituents such as calcium sulphate. Pressure Boosting : The pump raises the pressure of the pretreated feed water to an operating pressure appropriate for the membrane and the salinity of the feed water. Now a days, Energy Recovery Devices are used in tandem with Pressure Booster so as to cut down the energy costs. Separation : The permeable membranes stops the passage of dissolved salts while permitting the desalinated product water to pass through. Applying feed water to the membrane assembly results in a freshwater product stream and a concentrated brine reject stream. Because no membrane is perfect in its rejection of dissolved salts, a small percentage of salt passes through the membrane and remains in the product water. Reverse osmosis membranes come in a variety of configurations. Most common now a days are Thin Film Composite. Post Treatment : The product water from the membrane assembly usually requires pH adjustment and degasification before being transferred to the distribution system for use as drinking water. The disinfection is also done if the water is being used for drinking purpose. Reverse Osmosis, a membrane desalination process increasingly used worldwide, purifies brackish/ high TDS water for drinking, pharmaceutical & industrial purpose. RO membrane technology water with very less dissolved solids and which is also free from particulate and organic matter. Compact with MS powder coated frame. Removes up to 95-98% TDS to produce water that is clear and free from micro-organisms. User friendly, no regeneration, no chemicals like acid, soda, salts, etc. Enhance effects of your workout, take steam bath before you begin exercising. Find how?